This week, the Legislature’s Revenue Committee is scheduled to hold a hearing on LB 289, a bill proposing the largest tax increase in the history of Nebraska. April 15th is National Tax Day, and it’s a reminder that we have a long way to go to make Nebraska more competitive on tax policy. Overall, the Tax Foundation ranks Nebraska 24th nationally for tax climate. As a state that relishes national championships, we should also work to be #1 in tax competitiveness, so we can grow Nebraska. It is National Ag Week in Nebraska, and we are celebrating our state’s number one industry. This week, the Department of Agriculture and I will be visiting with some of the farm families and ranchers who are building opportunity in communities across our state and growing the food that helps feed the world. First in the nation for fiscal condition according to Georgetown’s Mercatus Center. Second best for regulatory environment by Forbes’ measure and second best for cost of doing business in CNBC’s rankings. Third best in the nation for wage growth. Fourth best for workforce participation. And the fifth on Forbes’ “Best States for Business” list. Since taking office, property tax relief for Nebraskans has been my top priority. Working with the Legislature, we increased the Property Tax Credit Relief Fund by 60 percent over the past four years. Right now, I have three property tax relief proposals before the Legislature. This week, I will be testifying on two of them during a hearing in the Revenue Committee. It’s well-known that Nebraska is a pro-life state. 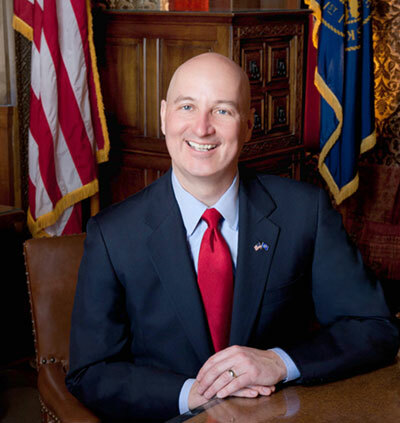 Over the years, Senators, Governors, and pro-life advocates have worked to make Nebraska a national leader in public policy protecting the dignity of human life. Less than a year ago, the Legislature stood with Nebraskans and voted for a pro-life budget. This was a big step forward in protecting the dignity of human life.